This weekend, Cartoon Sara and I returned from another trip to Walt Disney World. This didn't leave a lot of time for gaming with The Boy, so this week I wanted to talk about our recent trip. Mickey's Not So Scary (Oh, how I hate the name) Halloween Party is a special ticketed event held on select nights in September and October, plus the first night of November. The Magic Kingdom closes to most of the public 7pm and those who purchase party tickets are treated to a night of special shows, parades, fireworks, character greets, and even more additional pay events. The fan following for this event can be pretty enthusiastic, but when an adult ticket is going to cost you around $70, you can't help but start to wonder if this event is really worth the cold hard cash. You can wear costumes, even adults. It is possible that you have always dreamed of running around the Magic Kingdom in full costume. The trouble is that if you are an adult, Disney doesn't really encourage such things. In fact, people have been booted out of the park for wearing a costume that might be easily confused with that of an actual paid character performer. Disney spends a lot of money training their walk-around characters and they don't want some Tinkerbell impostor interacting with the guests without the Disney seal of approval. I know for some people this feels a little extreme, but it makes a lot of sense. You get two Tinkerbells crossing paths and the whole illusion can be ruined for a little one. And once you see how genuine and real those little kids are with the Disney characters, you won't want anyone ruining things for them either. During the Halloween Party however, all bets are off when it comes to costumes. People and families must plan all year because rarely has the people watching been so good when I have been at the park. And don't even get me started on how sweet it can be to see Mom and Dad as Jasmine and Aladdin carting around a baby dressed as Abu. During the Halloween party, everyone gets a bag and is welcome to visit the candy stations. You don't even have to say "Trick or Treat" before a cast member starts shoveling candy into your bag. The good news is that the candy is good stuff, and one stop at the treat station had us sugared up for the rest of the night. So that is certainly a plus. If you put this into the perspective of your $70 ticket, it becomes a lot less impressive because the candy lines can also get very long. And while I stood there, negotiating trades for The Boy's Now and Laters, it certainly crossed my mind that I could buy an awful lot of candy with $70. I feel that this is where you can see the real value of your party ticket. Disney has exclusive shows, fireworks, and a parade that can only be seen during the party. For me, this turned out to be a bit of a mixed bag. Though Disney will only sell a certain amount of tickets for the party event, the place was still really crowded and I am not a fan of getting dirty looks from parents when I find myself standing in front of their children (even if I have been there for 15 mins already and they are only coming up behind me a few minutes before the show is supposed to start). Also, I am not a huge fan of the shows that happen in front of the castle as they are often too cheesy even for me. The thing is that this year's show has a return of the Sanderson Sisters from Hocus Pocus and they are just SOOOOOOOO amazing. No really, feel free to spoil yourself by watching the video below. I thought my face was going to snap off from all the smiling and nostalgic glee. Beyond that though, I am not that into character greets and fireworks. Also, they only keep certain rides open, so it is possible that you were trying to get to something earlier in the day that you still won't be able to get to at night. Happily, most of the popular things are still running and the lines stay manageable since there are no fast passes are available, putting everyone essentially in the same spooky boat. You gotta give it to Disney when it comes setting the stage. As soon as the party starts, all the lights change in the park and even the cast members have changed into their party clothes. I was really quite impressed. So much that I even grabbed The Boy and Cartoon Sara at the Haunted Mansion to sneak a peek at a cast member who had eerily positioned herself in one of the hallways, staring at guests as they walked by. Oh, and she had skeletal make-up and cobwebs in her hair. Very cool. But $70 cool? More chances to spend all your money! The parks is just full of party "exclusives" to spend your money on. T-shirts, $15 pins, mugs... 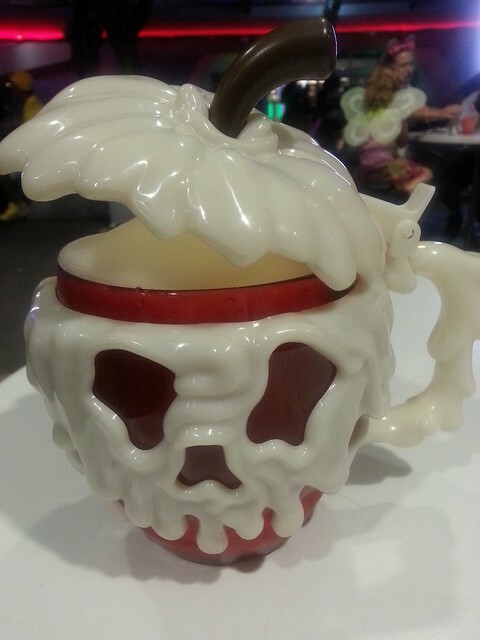 It's true that you can find some of these elsewhere and later, but it can be very hard to resist that lemonade slush filled poison apple mug when you are trying to stay up for an 11pm parade. Disney is a business and their business is making money. Don't you ever forget that. And in case you were wondering, of course I bought that mug. While I don't have any serious regrets about going, I will say that attending this event is something that I would certainly plan better going forward. With the high prices, this party can get insanely expensive before you even enter the park. The idea here is to decide what is important to you. Want a night when you can see as many Disney villain as possible? Love parades and fireworks to an insatiable but healthy degree? This party might be your dream come true. But if you have already been at the park all day, there is a very good chance you have done all the rides and are feeling tired, this leaves getting your money's worth feeling more like a chore than a fun challenge. Don't quite love the cutesy shows and literally bubble-gum scent parade floats? An evening at Trader Sam's Grotto might be more up your alley instead. As much as I enjoyed myself, I couldn't help but tally things in my head and think about what other things The Boy and I might have been able to do for $140. Especially since the EPCOT Food and Wine Festival is happening at the same time. Actually, now that I think about it, I think I might have seriously enjoyed this event more with a beer, or a shot of rum in my Dole Whip. ;) Sadly, that kind of thing is impossible to come by in the Magic Kingdom. If I were to attend this event again, I would not bother buying a ticket for the day. Instead, I would just buy a pass that with one less day and just use the event ticket to attend in the evening. I could then spend the day relaxing and getting ready. Otherwise, I would just leave the park at 7pm, avoid the party completely and find a quiet lounge to wind down in. Maybe destroy some poor unsuspecting but well-meaning families at Disney pub trivia. Now that my friends, is something I can say without a doubt is a good time. Sounds like a good time? Ever been to the event yourself and want a chance to chime in? You know what to do! Get all up in that comments section below!